Or, part of it is. The beta is going to be divided into three phases. The first, the compendium, listings and forums, opened today. The second will be the Character Builder and Character Sheet, while the third consists of homebrew integration and campaign management. What is out is still comprehensive, with the compendium providing a full breakdown of the core gameplay concepts as taken from the Player’s Handbook. It also lists every standard type of armour, weapon, mount, tool, and equipment available as well as their relevant properties. A more thorough and easily navigated list of these is available in the items page (see the screenshots below). Here, every item covered in the basic rules is listed and can be easily sorted and searched for by name, rarity, effect type, whether or not it requires attunement, and any tags attached. All of this information is undoubtedly available in third-party apps, but rarely in such a sleek and well-organised manner. The spell list receives the same treatment, and a cursory glance is all that’s needed to establish the important details of any spell listed such as their casting time, duration, range, components, and whether they’re an attack or require the target to make a saving throw. The search function here is similarly comprehensive, spells can be searched for by any of the terms above or by their school, damage type, tags, and the classes that can cast it. Finally, the monster list. Arguably the most beneficial addition to the digital DM’s arsenal, this compiles every stat block for every monster into one list. 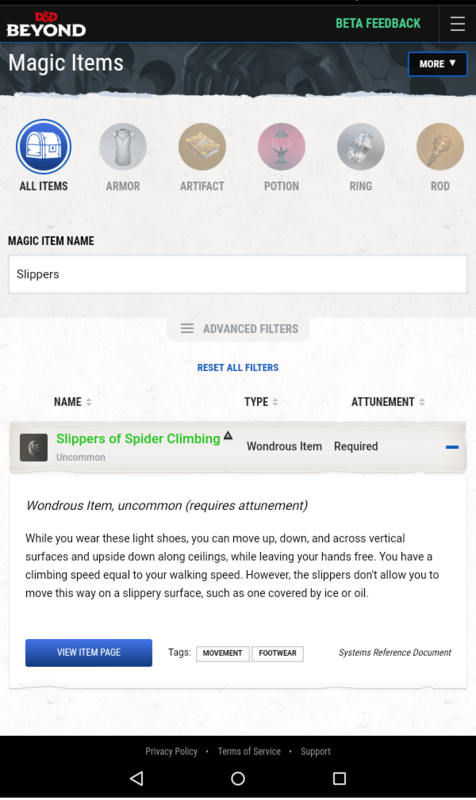 While I’ve been able to print off rudimentary item lists and have found an excellent spellbook app, there hasn’t been anything like this thus far. It can be troublesome having to bookmark or print off the stat blocks for every monster your players might encounter during a session, and this takes the sting out of that in a big way. Monsters are sorted by Challenge Rating, name, type (Celestial, Fey, Beast, etc. ), size, alignment, and environment. 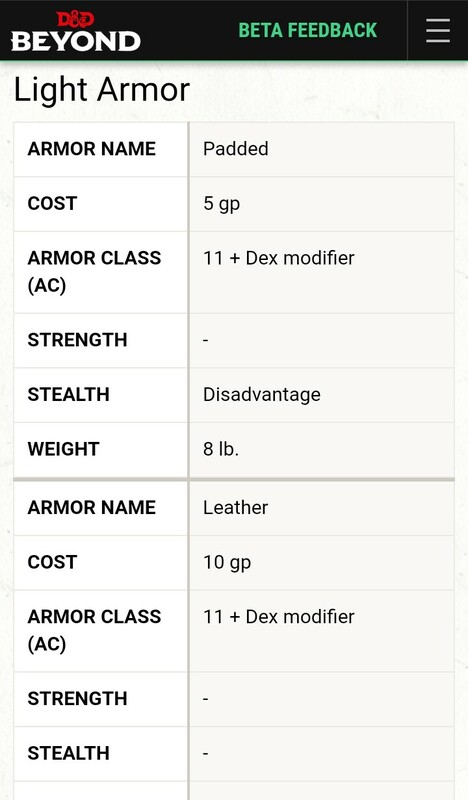 Here you can search by armor class or hit point ranges, or even by damage and condition immunities, in the event that you’re searching for a curveball to throw at a particularly a well-equipped group. It’s an excellent component and one that I could see myself making full use of in my games. The future looks bright for D&D Beyond. It has a ways to go before completion, but it’s still an impressive piece of kit as it stands. In terms of functionality, navigating Beyond is a breeze and load times are minimal. These do increase somewhat on tablet and phone, but loading a page never took more than a few seconds whether over wi-fi or a data connection. The only potential obstacle which could stand in the way of this making it’s way into regular use (for me, anyway) is the price. Wizards of the Coast have not commented on a payment model, and with no confirmation as to whether it will be a one-off payment or a subscription service, it remains to be seen how practical it will really be for DM’s who might use it less frequently. Either way I’ll be making full use of the beta, and will update as it progresses over the coming weeks.